-- even when they have the same horsepower rating. Skutt wheels by Thomas Stuart use industrial "continual duty" motors, designed to run at full speed without overheating for as long as the user requires. Other wheels may use "peak-rated motors" intended to provide full power without overheating only for short periods. The torque produced by a wheel is the amount of power you have to center clay. High torque at low speeds is important for potters -- but providing high torque at low speeds generates more heat in the motor. Temperature is the greatest enemy of variable speed motors, leading to worn parts and eventual failure. The larger motors on Thomas Stuart wheels have superior insulation and more windings, which allow greater dissipation of motor heat, plus integrated fans for additional cooling. This allows these motors to run cooler and last longer. Plus the additional torque at lower speeds gives these wheels great centering capacity -- higher than other wheels rated at the same horsepower. Shipping weight 127 lbs. Call for quote on freight or delivery to your location. 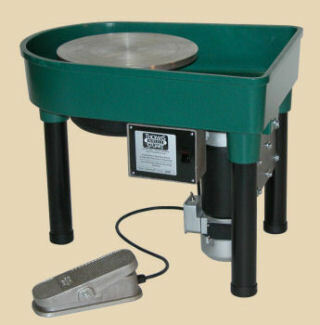 TSC Skutt Classic Pottery Wheel http://www.georgies.com/products/equipment/tsc.jpg Skutt Thomas Stuart Classic Skutt electric pottery wheel with integrated splash pan, 14 inch wheelhead and 1/3 hp motor. Call for quote on freight or delivery to your location. 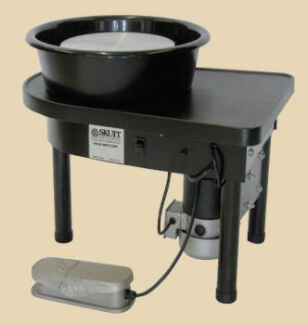 TSE Skutt Elite Pottery Wheel http://www.georgies.com/products/equipment/tse.jpg Skutt Thomas Stuart Elite Skutt electric pottery wheel with integrated splash pan, 14 inch wheelhead and 1/2 hp motor. Centers 400+ pounds of clay -- easily. 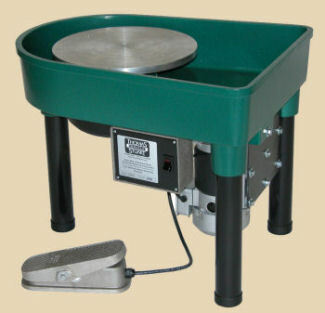 TSP Skutt Professional Pottery Wheel http://www.georgies.com/products/equipment/tsp.jpg Skutt Thomas Stuart Professional Skutt electric pottery wheel with integrated splash pan, 14 inch wheelhead and 1 hp motor. 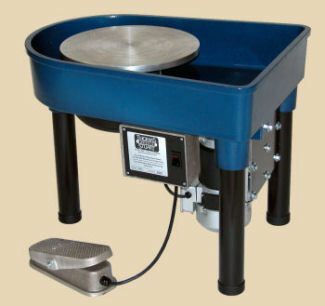 TSPR Skutt Prodigy Pottery Wheel http://www.georgies.com/products/equipment/tspr.jpg Skutt Thomas Stuart Prodigy Skutt electric pottery wheel with removable splash pan, 12 inch wheelhead and 1/3 hp motor. 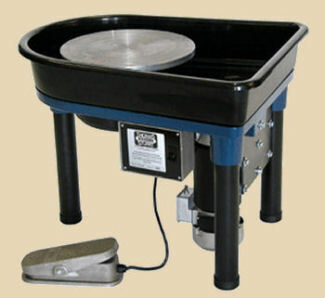 One of only three wheels available on the market with single-cast one-piece full-size splash pans. TSLW Skutt Legend Pottery Wheel http://www.georgies.com/products/equipment/tslw.jpg Skutt Thomas Stuart Legend Skutt electric pottery wheel with removable splash pan, 14 inch wheelhead and 1/3 hp motor. 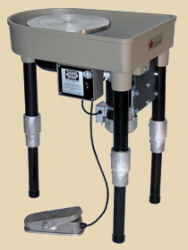 TSR Skutt Revolution Pottery Wheel http://www.georgies.com/products/equipment/tslw.jpg Skutt Thomas Stuart Revolution Skutt electric pottery wheel with removable splash pan, 14 inch wheelhead and 1/2 hp motor. 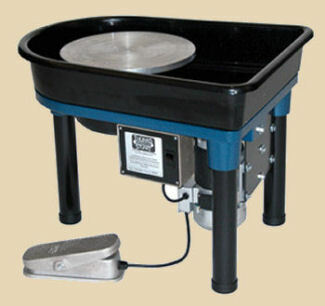 TSPW Skutt Premier Pottery Wheel http://www.georgies.com/products/equipment/tspw.jpg Skutt Thomas Stuart Premier Skutt electric pottery wheel with removable splash pan, 14 inch wheelhead and 1 hp motor. These extensions easily convert any Skutt wheel into a standup model by using unique aluminum clamps that attach to the 2" pipe legs. These legs make the wheel infinitely adjustable to a maximum 30" height. The SSX drive allows incredible sensitivity from the foot pedal at very low speeds. This drive system can be added to any Skutt wheel except the Prodigy as an after-purchase add-on, but the cost is lower when installed at the factory as part of your wheel purchase. We've listed both pricing options below for your convenience.